Buried UK government report finds fracking increases air pollution. The report was released four days after ministers approved fracking in Lancashire. A UK government report concluding that shale gas extraction increases air pollution was left unpublished for three years and only released four days after ministers approved fracking in Lancashire, it has emerged. The report, written by the government’s Air Quality Expert Group (AQEG), was given to ministers in 2015, but was published quietly on 27 July. Fracking firm Cuadrilla was given the first permit under a new regulatory regime on 24 July, the final day of the parliamentary year. The Labour shadow environment secretary, Sue Hayman, said: “The decision to grant a licence to Cuadrilla must urgently be reconsidered.” An earlier government report concluding that fracking could cause nearby house prices to fall by up to 7% was also delayed until after an important planning decision. “There’s a pattern emerging, with environmentally unfriendly government announcements being scheduled to pre-empt worrying reports by experts,” Hayman said. “The decision on Heathrow’s third runway was also taken days before the Committee on Climate Change reported on the danger of CO2 emissions.” A Labour government would ban fracking. “The thing that surprised me was you think the main sources of air pollution are going to be coming from the actual process of fracking, but it is as much all the industry – diesel generators, lorries running up and down roads, and all the stuff used to support it,” said Prof Paul Monks, at the University of Leicester and chair of the AQEG. The report’s conclusion remains valid three years on, he said: “That hasn’t changed. If you have any industrial process at a local level you are going to get an impact on air quality.” Some estimates of the size of the UK’s future fracking industry in the report reach 12,500 wells. “If you increase the amount of wells you are bound to broadly increase [pollution],” Monks said. The publication of the report on the library page of the government’s air quality website, and not mentioned on the site’s homepage, was first reported by specialist title the ENDS report. The report found that differences between the UK and US could both increase and decrease air pollution. UK shale fields are deeper, so more fuel needs to be burned to extract the gas, and the UK already has illegally high levels of nitrogen oxides in many places. But the number and density of wells is likely to be lower than in the US. Since the report was written, independent monitoring of air pollution has begun in Yorkshire to establish a baseline of emissions before fracking begins. “Sitting on a report until after giving fracking the go-ahead hardly inspires trust in the government,” said Connor Schwartz, at Friends of the Earth. “If research is carried out, it should be promptly released.” The most recent government polling shows just 18% of the public support fracking. “Air pollution is already a public health crisis that cuts 40,000 lives short every year and this report is yet more evidence of why we shouldn’t start fracking,” said Schwartz. “This Tory government has been dragged through the courts three times because of their failure to tackle illegal air pollution, but they’re still taking a cavalier approach to this public health emergency,” said Hayman. The earlier government report that found fracking could cause house prices to fall was heavily redacted when a Freedom of Information request forced its release in 2014. The full report was only published a year later after a ruling by the Information Commissioner. 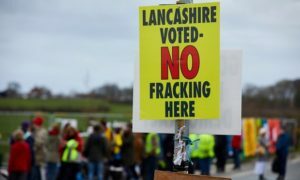 It emerged in 2016 that ministers had deliberately delayed the release of the full report until after the crucial decisions had been made by Lancashire county council (LCC) on planning applications to frack, representing “dirty tricks of the highest order”, according to an LCC councillor.